Friends From College on Netflix: Cancelled or Renewed for Season Three? Will these old college chums remain friends forever? Has the Friends From College TV show been cancelled or renewed for a third season on Netflix? The television vulture is watching all the latest TV cancellation and renewal news, so this page is the place to track the status of Friends From College, season three. Bookmark it, or subscribe for the latest updates. Remember, the television vulture is watching your shows. Are you? 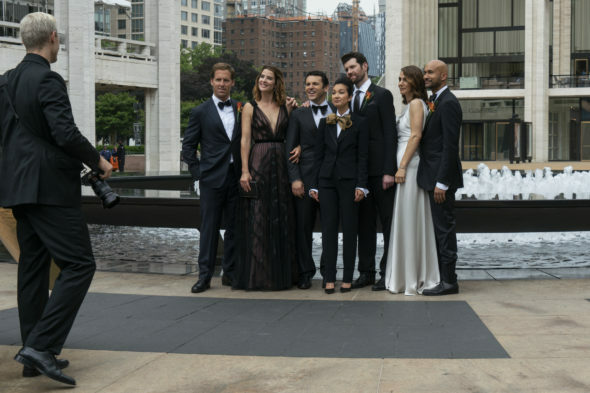 A Netflix comedy, Friends From College stars Keegan-Michael Key, Cobie Smulders, Annie Parisse, Fred Savage, Nat Faxon, Jae Suh Park, and Billy Eichner. It centers on a group of friends, who bonded at Harvard University, nearly 20 years ago. The series explores how professional and personal growth and upheaval can affect friendships. As their lives change, these friends from college begin to wonder what — if anything — they still have in common. The storylines delve into issues including infidelity, infertility, and immaturity. As their youth slips away, and reality tempers their big dreams, can they find a way to make their friendships last? Should they? Friends From College has been cancelled so there won’t be a third season. Could it be revived someday? Stay tuned for further updates. Because Nielsen doesn’t report on streaming TV series, it is difficult to gauge how a Netflix show is doing, unless they publicize its performance. For now, I will keep an eye on the trades and press releases and update this page with any news. Subscribe for free Friends From College cancellation or renewal alerts. 2/19/19 update: Netflix has cancelled Friends from College so there won’t be a third season. Find more Friends From College TV series news or other Netflix TV show news. What do you think? Should the Friends From College TV show have been renewed for a third season? Are you sorry that Netflix cancelled this TV series, instead? More about: Friends From College, Friends From College: canceled or renewed?, Friends From College: ratings, Netflix TV shows: canceled or renewed? After Life: Is the Netflix TV Show Cancelled or Renewed for Season Two? The Innocents: Is the Netflix TV Series Cancelled or Renewed for Season Two? Turn Up Charlie: Is the Netflix TV Series Cancelled or Renewed for Season Two? American Vandal: Cancelled or Renewed for Season Three on Netflix? Flaked: Is the Netflix TV Series Cancelled or Renewed for Season Three? Love this show!!! Binged watched every season in one weekend!! Please bring it back! It’s different, hilarious and very addictive! Best series ever! It was like,2 seasons of a romantic comedy! We need more!